1. The Name of the Star by Maureen Johnson: I read the first few chapters when she had them posted on her website. I finally bought the book when the paperback came in. 3. Vampire Academy by Richelle Mead: It was on sale and I was in the mood for vampires. 4. Cinder by Marissa Meyer: A friend gave me her ARC for this! Though she warned me that she didn’t agree with all the good reviews. 6. Stork by Wendy Delsol: Another ARC from my friend! Haven’t actually heard of this one. 7. Promise of the Wolves by Dorothy Hearst: Saw it on the shelf, hadn’t heard of it, read the first few pages, bought it. 8. Middle Ground by Katie Kacvinsky: Won this in an ARC contest, haven’t read the first book yet. Now for the ebooks. I bought both when they were on sale! I just finished Etiquette & Espionage! – quite cute, enjoyable and an easy read. Hope you like it when you finally get to it 🙂 Only other one I have read is Vampire Academy – also super fun. Good luck getting to them, I find when I put mine aside for whatever reason it takes even more effort for me to get to them – lame! I might have to try to work on my list soon. Yeah, my biggest problem is that I keep buying books! Haha. 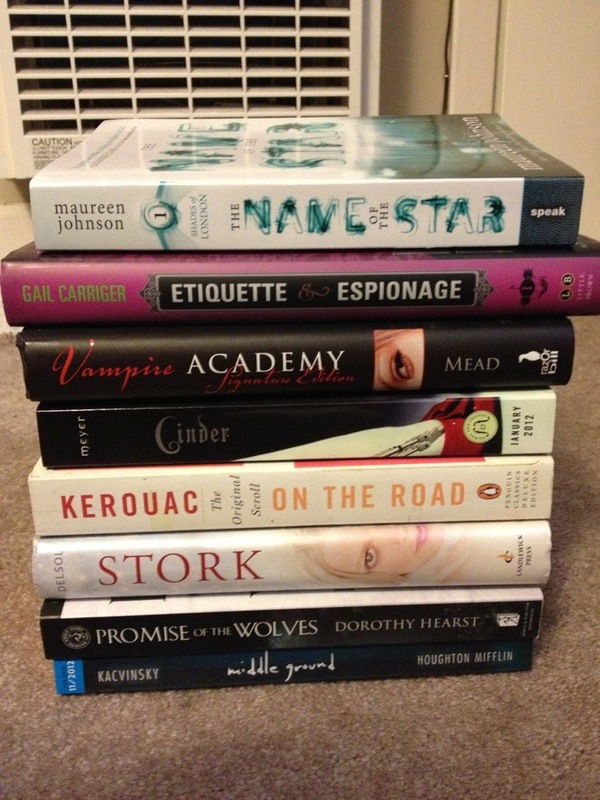 One of my goals this year is actually finish them before I bury myself in an unrealistic TBR list (like I usually do! ).